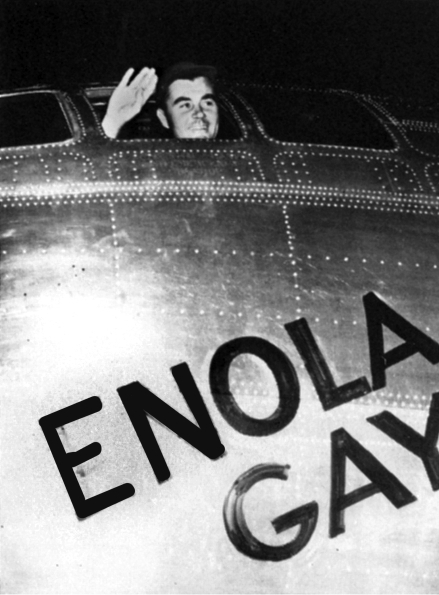 Lt. Col. Paul Tibbets waves to the ground crew on August 6, 1945 as he pilots the B-29 bomber “Enola Gay” on its last bomb run. He flew from Tinian Island in the Pacific to drop the first atomic bomb on Hiroshima, Japan that help end World War II a few days later. The “Red Gremlin” was the plane he piloted as commander of the first B-17 squadron to bomb Nazi-occupied France during the summer of 1942 as part of the 97th Bombardment Group. Sgt. Orville Splitt of Englewood, Fla. was the radio operator on that B-17. Splitt now lives in Englewood, Fla. Tibbets came to nearby Punta Gorda in April 2002 to speak to the Punta Gorda Rotary Club and serve as honorary chairman of the 22nd Annual Florida International Air Show held at the Charlotte County Airport. Splitt was there. The two old warriors met at the Best Western Motel in Punta Gorda. As they sat on the porch of the motel’s restaurant having breakfast overlooking Charlotte Harbor with pelicans fishing in the distance and mullet jumping nearby, World War II seemed far away and long ago. Tibbets and Splitt were having a great time shooting the bull. They were oblivious to the world around them. People were staring and pointing at the two gray-haired men. Word had gotten out at the motel that the man who dropped the bomb on Hiroshima was staying there for the weekend. During an interview, prior to his speech to the Rotary Club, the general recalled the first time he realized he had been assigned to a super-secret project that would end the war. ”I was testing a B-29 to see how it would respond to fighter attack at Alamogordo, N.M. I got a call from my top level boss to report to his office at Colorado Springs, Colo. the next morning and bring my clothes,” he said. “I showed up on time and a few minutes later a lieutenant colonel walked out of the general’s office and introduced himself. “’I want to talk to you,’” he said. “His inquisitor had Tibbets’ dossier. They went into a nearby cloakroom and closed the door. The colonel began by asking him about his college days. Then he got to the point. “By this time I realized he was trying to find out if I would lie to him. I played it right down the center,” Tibbets said. The colonel, who was interrogating him, had heard enough. “We went back into the general’s office and he said, ‘General, we’re perfectly satisfied with Tibbets.’ I had passed the test,” he recalled all these many years later. 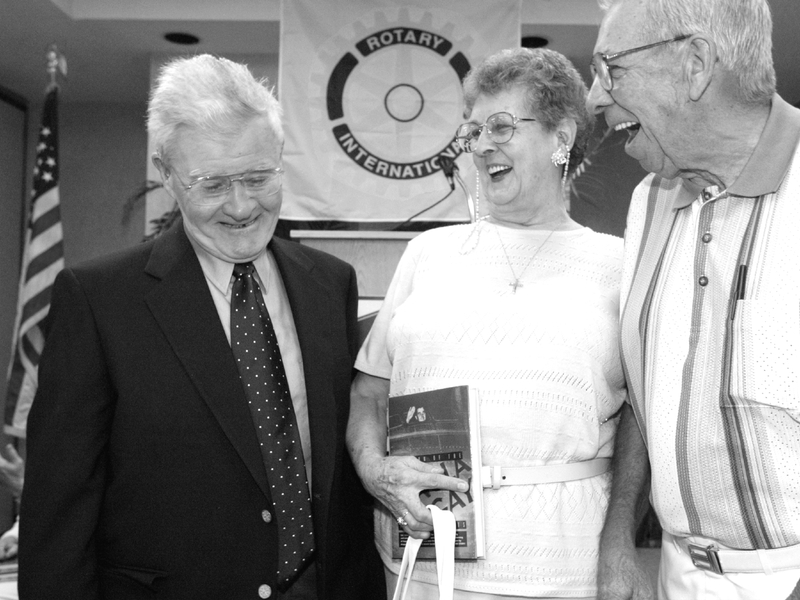 Jean Dettmann and her husband, Floyd, arrived at the Best Western more than an hour before the general was to speak. The Port Charlotte woman helped build the “Enola Gay.” She once worked in the Martin bomber plant in Omaha, Neb. in the 1940s. Dettmann was allowed to write her name and phone number above the pilot’s seat on the bomber’s aluminum skin before it left the factory for its historic mission in the Pacific. What she wanted Friday morning was a picture of herself together with the famous bomber pilot. 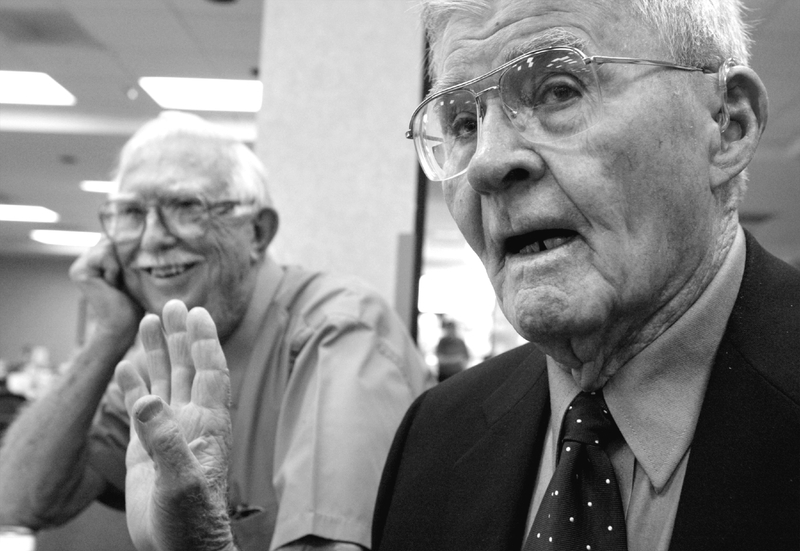 Jean had just purchased his latest book, “Return of the Enola Gay” that Tibbets was marketing around the country. A stack of books sat on a table near the door of the meeting room ready to be sold during the Rotary luncheon. With the silver-gray book clutched to her bosom Dettmann was introduced to Tibbets as the lady that built the “Enola Gay.” The general’s face lit up. The two talked for a few minutes as newspaper photographers took pictures of their encounter. At one point Jean, who is a bit taller than the diminutive Tibbets, threw an arm around him. With a smile on both their faces she looked like she was in heaven as photographers kept taking their picture together. “You never called me,” Jean said out of the blue to the ancient aviator. “I put my name and phone number on your bomber over your seat but you didn’t call,” she looked hurt. Tibbets had long-time connections to Florida. He and his family moved to the Miami area from Iowa in 1924 when he was 9-years-old. He grew up there and attended the University of Florida as a freshman and sophomore beginning in 1933. His father wanted him to become a doctor. Since UF had no medical school in those days, his dad had him transfer to the University of Cincinnati’s Medical College. By this time Tibbets was bitten by the flying bug. It started years earlier while still a kid in Florida. At 11 he was hired to throw “Baby Ruth” candy bars on tiny parachutes out the open cockpit of a Waco-9 fabric-covered biplane as a promotion stunt while it slowly circled above the crowd at the Hialeah Race Track. Tibbets finally got up enough nerve, during his third year in college, to tell his father he wanted to be a pilot, not a doctor. A few days later, in 1938, he enlisted in the U.S. Army Air Corps as an aviation cadet.The rest is history. In the front of a well-worn copy of another Tibbets’ biography, “The Paul Tibbets Story,” is an inscription the general wrote in blue ink. “Nothing gives me more pleasure than to inscribe a few words in this book belonging to ORVILLE S. SPLITT, Page 67 fails to develop our relationship and some of the “Less Than Smooth’ experiences we had together in B-17s –especially the ‘RED GREMLIN’ that Orville was responsible for naming. Splitt flew a number of missions with Tibbets, but the two most notable ones were the secret flight to Gibraltar with Gen. Mark Clark and the second flight to “The Rock” with the Commander-in-Chief. The Allies were about to invade North Africa in the fall of 1942. They were hopeful they could get the French in Algiers to join the Allied side in the war, even though they were under the German’s thumb. During a top secret meeting between Gen. Dwight Eisenhower and Prime Minister Winston Churchill, they decided to send Clark, Eisenhower’s deputy, to meet secretly in Algiers with the French commander. He flew from England to Gibraltar aboard the “Red Gremlin” with Tibbets at the controls and Splitt on the radio. From there he was taken in a British submarine to the African coast where he took a rubber boat ashore and rendezvoused with the French. It was the return flight to England that got hairy for Clark and the “Red Gremlin’s” crew. It was unusually cold and the plane’s wings were icing up. They were also confronted with a serious fog problem that caused them to fly just above the waves. It was a rough flight back, but they made it without incident. The second half of the story involving Split and Tibbets also involves Eisenhower. It was Nov. 5, 1942 and Tibbets asked his radio operator, who was ill at the time, to fly with him on a “secret mission.” Of course the young sergeant agreed sick or not. Six B-17s were sitting on the runway at the Royal Air Force base at Bournemouth, England in fog so thick you could cut it with a knife. A line of staff cars rolled up in front of the bombers. Out stepped Eisenhower, the Commander–in-Chief of Allied Forces in Europe. So the Commander-in-Chief and his staff boarded the B-17s and they flew off into the fog headed for Gibraltar. Once the bombers gained altitude the fog cleared and everything was fine. They arrived just in time for Eisenhower to start the U.S. ground offensive against Hitler in North Africa on Nov. 7, 1942. “What do you say to people who maintain that there was no need to drop an Atomic Bomb on Hiroshima? The Japanese were ready to surrender, that was overkill?” Tibbets was asked. “First of all, war stories are told in two phases. One is the fairly tale, ‘Once upon a time … (Revisionist History). But real war stories are not B.S., this is the way it happened,” he explained with steam coming out of his ears. Tibbets said at least 80,000 people were killed because of the bomb he dropped. 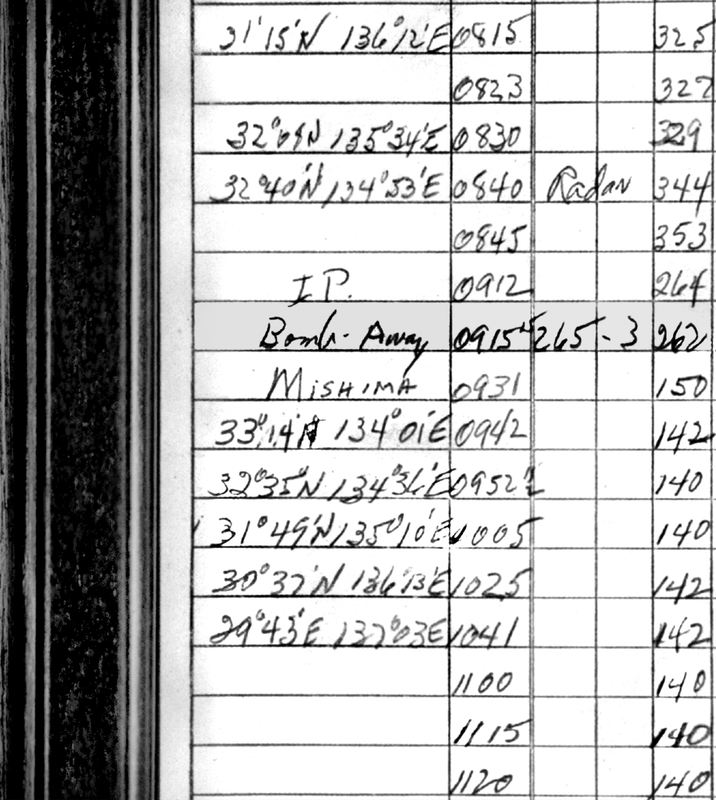 The “Bomb Away” in the gray-tinted line of the “Enola Gay’s” flight log indicates exactly when the first atomic bomb was dropped on Hiroshima. “When I got the assignment to drop the bomb on Hiroshima I knew I had to be successful,” he said. “Because if we were successful we could convince the emperor of the futility of continuing the fight. “MacArthur’s headquarters in the Pacific estimated that if we had to invade (the Japanese main Islands) we would lose 1 million men killed and wounded. “I’ve been to Japan a number of time after the war. The people over there ask me, ‘Why didn’t you drop the bomb earlier and stop the war? '” Tibbets said. A couple of years ago the Smithsonian Institution in Washington, D.C. had a portion of the “Enola Gay” on display that caused an international flap. He was asked what that was all about. “The Smithsonian had come up with a proposal to display the airplane as an exhibit. It was fraught with errors because revisionist historians had written the whole damn thing,” Tibbets said. “I wouldn’t hesitate a minute,” Tibbets replied. 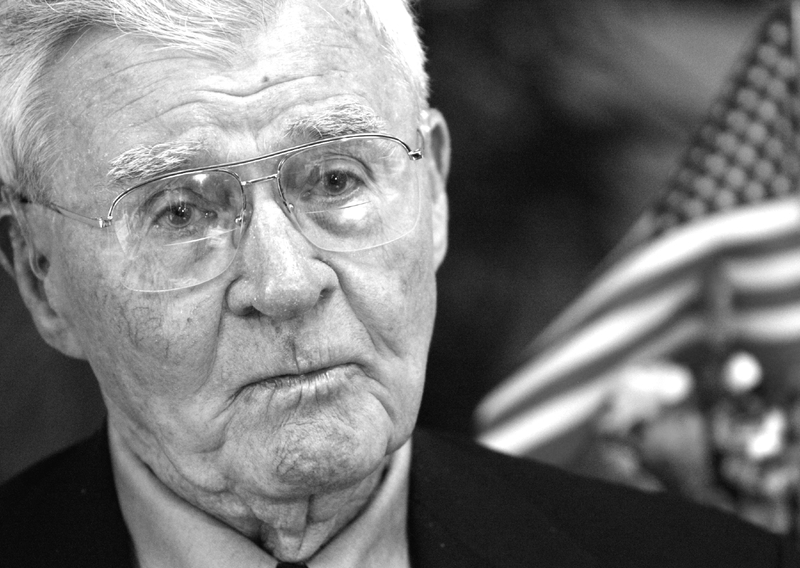 This story was first published in the Charlotte Sun newspaper, Port Charlotte, Florida on April 13, 2002 and is republished with permission.Colonel Tibbets was 87 at the time of this interview. Dropping an atomic bomb on Hiroshima, Japan, that killed at least 80,000 people at the end of World War II was the right thing to do. It saved millions of lives in the long run. That’s what retired Brig. 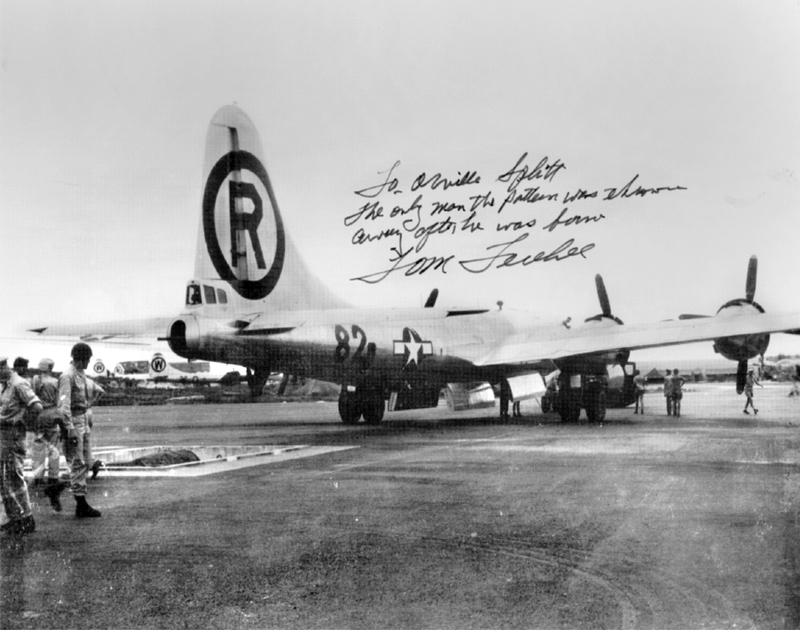 Gen. Paul Tibbets, who flew the Enola Gay on Aug. 6, 1945, told me when he was in Punta Gorda in 2002 for the annual Florida International Air Show, held at the Charlotte County Airport that April. He told me he had no regrets. In fact, Tibbets said, the atomic bomb probably saved millions of lives. The former B-29 bomber pilot said he talked to Gen. Douglas MacArthur’s staff shortly after Hiroshima was flattened about estimated losses if Allied forces invaded the Japanese home islands. MacArthur’s people told him they estimated upwards of 1 million more Americans would have been killed and wounded during the invasion. An additional 250,000 Brits would also have been KIA and MIA during the invasion. It was also estimated that as many as 5 million Japanese would be killed if the invasion had been carried out. Many Japanese asked him after the war why the United States hadn’t dropped the atomic bomb sooner. He said they explained to him it would have saved thousands more lives because the war would have ended quicker. Before he dropped the bomb, Tibbets was the commander of a B-17 bomber squadron that went to Europe in 1942, during the early months of the war. He and his squadron took on the Luftwaffe during Germany’s high water mark in the air. When Tibbets was in this area in 2002, he had the chance to reminisce with Orville Splitt, formerly of Englewood. Splitt was Tibbets’ radio operator aboard a “Flying Fortress” named “The Red Gremlin” that flew in the 97th Bombardment Group out of England. Splitt told the story about when he and Tibbets flew Gen. Dwight D. Eisenhower from England on a secret mission to Gibraltar just before the start of the Invasion of North Africa in November 1942. There was no space for the Supreme Allied Commander so they stuck him on the floor of Splitt’s radio room in the B-17. This is interesting thank you for the article. My Grandfather just past away a month back, had brother that flew with these guys on the Red Gremlin. His name was William “Willie” Tittsworth. He was the tail gunner for this crew. If you have any stories about these guys I would love to hear them.